For the majority of students, involvement in extracurricular activities plays an important role in the educational experience. Students become involved in extracurricular activities not only for entertainment, social, and enjoyment purposes, but most important, to gain and improve skills. A wide range of extracurricular activities exist at our college, meeting a variety of student interests. The importance of extracurricular activities in educational institutions is well established. The primary goals of extracurricular activities focus on the individual student level, the institutional level, and the broader community level. These activities exist to complement the school's or the college’s academic curriculum and to enhance the student's educational experience. Extracurricular activities provide a setting to become involved and to interact with other students, thus leading to increased learning and enhanced development. Specifically, a student's peer group is the most important source of influence on a student's academic and personal development. By identifying with a peer group, that group may influence a student's cognitive development as well as his or her behavior. MIET Biotechnology Society (MBS) of the Department of Biotechnology conducts various academic and extracurricular activities and publishes the magazine with the name “Biotaction”. 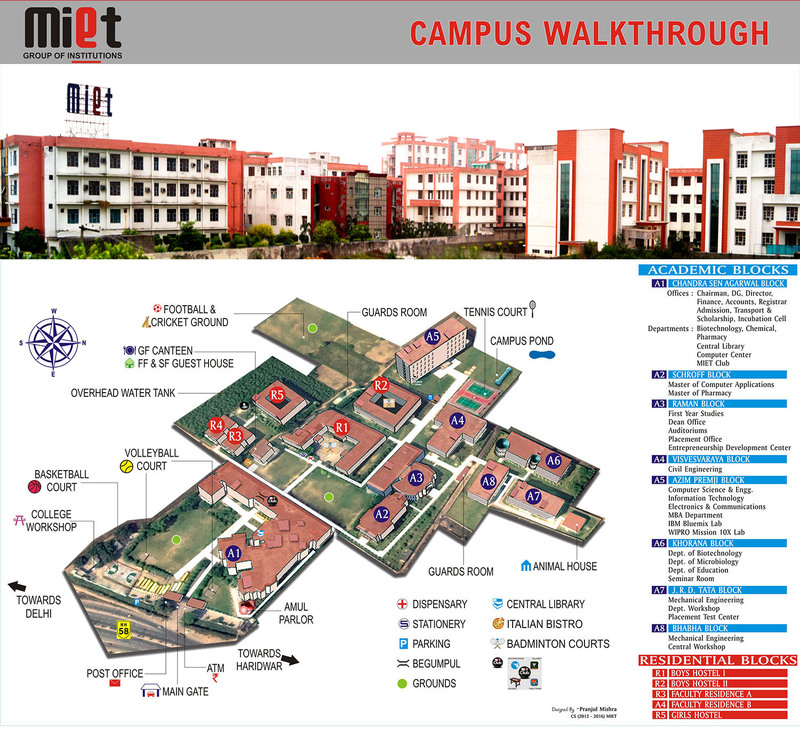 COMPASS, society of the department of Computer Science & Engineering, organizes various activities for the students along with the annual publication of its magazine-WIT. Society of Electronics Engineers organizes various activities for the students along with the annual publication of its magazine- ELECTROCOM. VISTA, the society of department of MCA, organizes various activities for the students to judge and promote technical and non technical skills among students. Mechanical Engineering Department boasts several technical and non-technical societies and departmental clubs to promote overall growth of students some of which are abhi – YANTRA and departmental committees are GO-Kart and SAE BAJA. ACES (Association of Chemical Engineer Students) is a student run and supported organization dedicated to promoting interaction among students , organizing academic and social activities and enhancing students overall personality. The mission of ACES is to promote the exploration of new academic horizons in Chemical Engineering, to facilitate and organize activities of the key academic group and to work, think and plan together in a cooperative environment. MPS (MIET Pharmaceutical Society) is a society of department of Pharmaceutical Technology, MIET & established in 2007. Aim To provide a common platform to its members to achieve and enhance their professional activities & participates with academically sound multi disciplinary standing. Develop creativity, integrity, team spirit, leadership qualities and confidence in the students. Help create awareness among members about the new research and technological development over a wide range of industrial fields related to Pharmaceutical Science. Equip students with the global perspective in related fields. Bring together the diverse Pharmaceutical communities to exchange knowledge and enable its members to become responsible technical leaders to benefit society. Provide a broad range of opportunities for peer interaction and career development according to professional and scientific interests. Odyssey, Literary Committee, is meant to promote literary activities amongst the students as well as to prepare and arrange for publication of Magazine for the college. Odyssey, in true sense is a long and eventful journey. Not only does it offer a common platform for the students to exhibit and whet their skills, it also makes a sincere effort to direct and shape the public opinion so as to create an intellectual impact and contribute towards policy decisions/debates at all levels. It provides students a great opportunity to compete with the best upcoming orators; thinkers etc. and thus, attract a huge participation in every event under its banner, and hands out many attractive prices. Abhivyakti, Literary Committee of Girls Hostel: To remove the inhibitions, the fear of humiliation by failure while walking on the path to success, we desire to provide a genuine and capable platform where the lasses can come up to and learn the importance of expression!!! Cultural club “Sanskriti” exists to develop musical talent and other cultural activities in our student. Dramatic club focuses to present theatrical performances and variety shows etc., to develop and explore musical and the latent talents of the students. Hostel Welfare Committee “Sankalp” is working for the welfare and wellbeing of the hostel environment.